SiliCycle is the leader in the development of functionalized silica gels, gathered under the name SiliaBond, for use in organic synthesis. The backbone of all SiliaBond products is SiliCycle SiliaFlash® F60 which provides superior performance for all types of applications due to the narrow particle size distribution and high purity. All the products in this section are made of standard flash silica gel, namely 40-63µm, 60A. 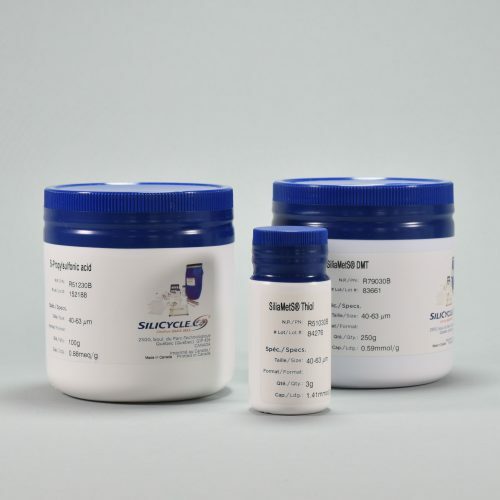 SiliCycle is able to provide all functionalized products on any silica of this catalog (SiliaFlash, IMPAQ™, SiliaSphere™ and SiliaSphere™ PC) in any format (SiliaPrep™ SPE and SiliaSep™, SiliaSep, etc.) on a custom basis. Compares very favourably to polymer-based reagents: no swelling, thermally stable, more easily scalabe, faster kinetics, compatible with all solvents and mechanically stable. SiliaCat is the heterogeneous catalysts family from Silicycle. It is made by using an innovative technology that confers these materials advantageous properties for catalysis. SiliaCat is an organically modified silica made by a proprietary encapsulation process resulting in a new chemical matrix structure. SiliCycle’s SiliaMetS Metal Scavengers are functionalized silica gels designed to react and bind excess metal complexes. In recent years, the time pressure associated with quickly bringing candidate drugs to market has increased the number of transition metal-catalyzed reactions being transferred from lead optimization to early scale-up. The removal of post-reactions metal residues has become a major issue in the pharmaceutical industry. Purification of APIs from residual metal catalyst by traditional methods (chromatography, activated carbon, distillation, etc.) often leads to problems such as high costs, time loss, low efficiency, and reduced API yields. To overcome these limitations, SiliCycle has developed SiliaMetS Metal Scavengers, a range of products that have significantly changed how chemists can purify APIs.